How important is it for you to do business with a reputable business? Are you like the millions of Americans that utilize online reviews as a preferred resource to glean if a company is reputable or not? If you were to scour the Internet for dumpster rental reviews of all our Bin There Dump That franchises, you’d quickly discover a lot of satisfied and overjoyed customers. For homeowners and contractors in the Houston area, they’d soon discover that Bin There Dump That Houston excels in three areas like the other Bin There Dump That franchises; they’re prompt; they’re professional; and they’re helpful. We’re like you, we hate when phone calls go to voicemail. Obviously, we live in a world of instant gratification and businesses need to adapt to this. This is why your local Bin There Dump That franchise has a local Dumpster Consultant ready to help find you a dumpster solution to your waste disposal of your home improvement project. 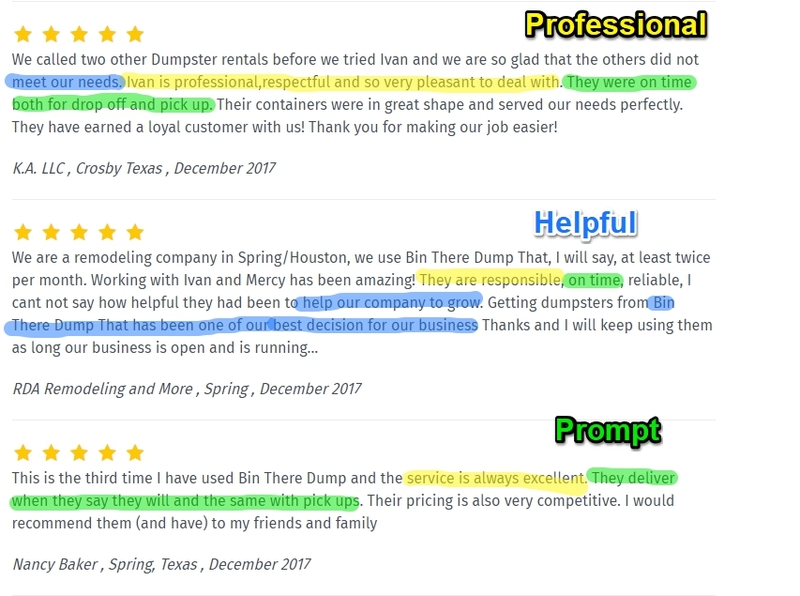 For Bin There Dump That Houston, Marcy is a friendly and consultative professional; ready to customize a dumpster rental for all homeowners. As the three reviews highlighted illustrate, being prompt and meeting scheduled delivery/pickup times is coveted by homeowners and contractors across the United States who use our services. Through Bin There Dump That’s operating system, Houston and other Bin There Dump That franchises can easily communicate with their delivery experts to assure an on-time delivery and pickup. Ivan’s Dumpster Delivery Experts travel to homes throughout the greater Houston area in a clean uniform, driving a clean truck with a shiny green bin on the back of the truck. Dumpsters are often assumed to be an eyesore on your driveway; we venture to change that belief with our clean, lime-green bins. 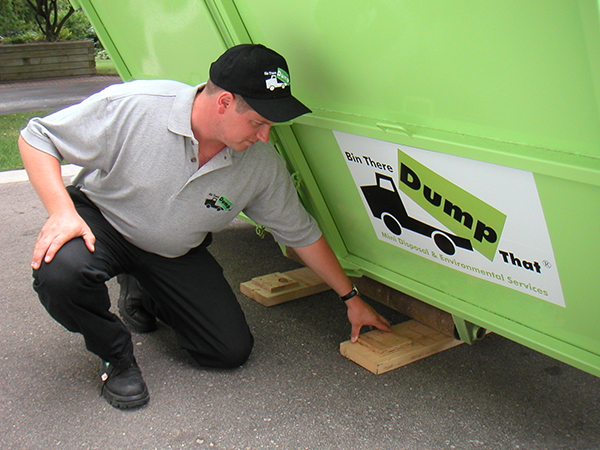 When available, Delivery Experts make sure to show homeowners how to utilize the double walk-in doors for the most efficient loading of the dumpster. We put a premium on customer service, meaning we make sure to respect your time and property. As noted, Bin There Dump That is prompt with deliveries and pickups but we also assure your driveway is protected from driveway scratches; we lay boards down to protect the surface. Often roofing nails, other harmful debris may not make its way into the dumpster. This is why we sweep up after to further protect your property. Throughout America, we work with hundreds of contractors. We are helpful to them because we have a great appreciation of their needs; they want reliable and simple waste disposal to complete their clients’ project and move onto their next project. Recently, we have made renting a dumpster with Bin There Dump That an easier task with the contractor dumpster ordering portal. This provides contractors accessibility to previous orders and select their favorite size of dumpster for future orders.